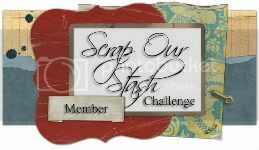 I was chosen to be a Guest Designer for December on Cookin' Up Scrapbooking Creations! What a honor! I am so excited to be a Guest Designer for this month! You have to come check this site out! All you have to do, is click on the highlighted name of the site above! Cookin' up Creations will be counting down the days until Christmas, and even a few days beyond. Beginning December 1st, 2009 and each day thereafter, until the end of the year, our Design Team will be posting a daily challenge. These challenges can be anywhere from making homemade gifts & ornaments, to making dog treats for your favorite pooch, to sharing their favorite cookie recipes with us. And let's not forget some scrapping challenges thrown in there as well!! Each day we'll be inspired once again to make something different in this season of giving!! It'll be a month jammed full of fun and games, so please be sure to come join us as we celebrate the reason for the season and countdown the days until Christmas and beyond! I will be creating 4 projects to include in this awesome challenge, along with creating Design Team projects. My goodies are on the way, so I can't wait until they get here so I can get started!!!! The creation below was the layout I entered in the "December Guest Designer" contest! Glad to have you on board with us this month Mardi....thanks for posting this! Congrats Mardi! I am so proud of you!